Today many people grow flour corn solely for decoration. Flour corn varieties certainly are beautiful but they have so much more going for them than their looks! 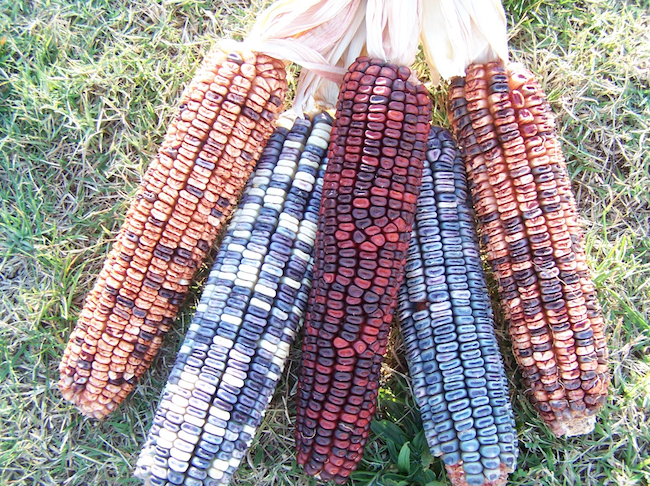 Many Native American cultures relied on these corns as a staple food. Today they’re still an excellent way to produce and eat a more local diet. They really aren’t difficult to process into delicious cornmeal, flour, or grits. Most flour corns have two numbers listed for “days to maturity.” The first number or set of numbers is when the corn will be ready to harvest in it’s milk stage like you would sweet corn. You’ll know it’s at this stage when the tassels turn brown. It won’t be nearly as sweet as modern hybrid sweetcorn however it’s still quite tasty when roasted with butter. The second number or set is when your corn will be fully mature and ready to harvest for flour. The husk should be papery and dry. You should harvest your corn on a dry day before your first fall frost. Then you can pull the husk back from the corn and hang them so the kernels can finish drying completely. Traditionally corn husks were sometimes braided or tied together to hang the corn in small bundles. You’ll know when the corn is completely dry because the kernels will crack instead of squishing under pressure. It should be noted that gourd seed and popcorn varieties can also be processed into flour and Native Americans often used them this way. When your corn is dry it can be processed. The first step is to shell your corn. This can be done by hand or with a corn sheller. Doing it by hand can be time consuming and tiring if your doing anything but a very small quantity. At SESE we offer two handheld corn shellers, one for flour corns (above right) and one for popcorns. You can also sometimes find larger corn shellers like the one pictured above left at antique stores, flea markets, or auctions. Once your corn has been shelled odds are they’ll be bits of corn cob mixed in which is also called chaff. To remove this you’ll need to winnow your corn. Don’t worry though it’s easy and there’s no special equipment required. Simply place a quantity of your corn into a large bowl or bucket. Then place an empty one in front of a fan. A household box fan will work perfectly. Then slowly pour your corn into the bucket in front of the fan. The fan will blow away the lighter pieces of material while the corn will fall into the other container. You may have to repeat this several times before the corn is clean. It may seem like you should now be able to just grind your corn and eat it there’s actually another step. In order to get the all the available nutrition from corn it needs to be nixtamalized. 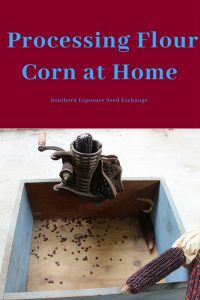 Traditionally this was done by soaking or boiling the corn in lime water. Native Americans in North America used wood ash for this but today it’s common to use pickling lime which should be easily available with home canning supplies. Pickling lime is caustic so rinse it off quickly if it gets on your skin and avoid getting any in your eyes. Be extra careful if there are small children around. Dissolve your lime in your water and combine the lime water and corn and bring them to a boil. Avoid aluminum pots as they react with the lime. Turn off the heat and let your corn soak overnight. In the morning rinse your corn well in a stainless steel colander. While it’s rinsing rub off some of the corn’s outer layer (this will give you a finer flour). The corn can then be used whole in soups or stews or ground into flour. Depending on what you’re using to grind your corn you can grind it wet or dry it to grind later by laying it out in a single layer on a screen or using a dehydrator. For a more in depth look at the history and importance of Nixtamalization check out this article from Cook’s Illustrated. **For most people this corn isn’t going to make up a large part of your diet so it won’t be harmful to skip this step if you feel you need to. Traditionally corn was ground in a mortar and pestle or with a grinding stone. Thankfully today there are a variety of home grain mills available that are suitable for grinding corn. You can find ones that are hand crank or electric, ones with stone grinding wheels and ones with metal, and mills that can handle wet, oily products and those that can’t. What you choose will depend on your budget and goals. Depending on what you’re hoping to make with your corn (like fine flour for tortillas or courser corn for grits) you’ll need to set your mill to achieve a specific coarseness. Some mills may require more passes to produce fine flour. If your mill is taking multiple passes it may be helpful to strain the corn through a wire mesh colander and run the larger pieces back through separately rather than the entire batch. If you grow an ample amount of corn your going to want to store some for later. Flour corn is best stored at two stages. First it can be stored on the ear once it’s completely dry. You can even leave it hanging if you want. Alternatively, to save room you can store it in containers after it has been shelled and winnowed. It will stay fresh much longer as whole kernels than if you grind it into flour. Adding flour corn to your backyard garden is a great way to produce more than just fresh produce for yourself. It’s easy to grow and store for use throughout the year and making your own grits or tortillas can be a great family activity.